Two hours: $400.00 Latest pickup 5 pm. Overnight: $450.00 Set up by 11 am picked up the next morning. This 23 foot long rock climb slide features a 20 foot tall rock climb wall and slide. This rock climb wall is a MONSTER and will challenge anyone who tries it! Our Vertical Rush rock climb slide is often used by itself and can also be combined with any of the other sections but must be the last section when combined with other sections. 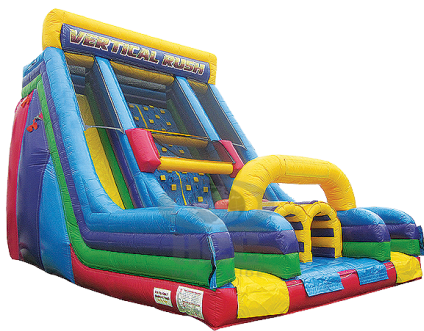 A lot of fun when used by itself and the perfect obstacle course ending when used with other sections.